By offering the taste of sweetness without any calories, artificial sweeteners seem like they could be one answer to effective weight loss. The American Heart Association (AHA) and American Diabetes Association (ADA) have given a cautious nod to the use of artificial sweeteners in place of sugar to combat obesity, metabolic syndrome, and diabetes, all risk factors for heart disease. 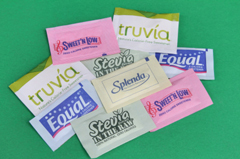 As with everything, there’s more to the artificial sweetener story than their effect on weight. One concern is that people who use artificial sweeteners may replace the lost calories through other sources, possibly offsetting weight loss or health benefits. It’s also possible that these products change the way we taste food. Research also suggests they may prevent us from associating sweetness with caloric intake. In addition, the long-term effects of artificial sweeteners on health have not been fully determined.